Hello people. Considering how many hours a day I typically spend on my computer it still amazes me how I can't get a blog post out. Today I write from the town of Dorfen, Germany, just outside Munich. My good friend Brigitte put me up in her large flat, cooked for me, registered the van with me (twice), took the van on its semi-annual inspection, got an oil change with me, and then also invited into her house my friend Regina, who flew in from London to travel with me in the van. I'm well taken care of, and I'm SO appreciative. When I was in the Bay Area for a month, I picked up my U.S. van (I have two vans!) from Lillie's house, where she has stored it for me for a year and a half, and I stayed for three weeks with the Perlstadt family and their beautiful kids. The list goes on. It would be impossible for me to live this unusual lifestyle without good friends who support me and allow it to happen. Lovely! Regina and I are (finally) giving Brigitte some peace by heading south today. We're driving through Austria into the Dolomites region in northern Italy. From what I've heard from friends and seen in photos, it's incredible. Photos will be flooding your computer soon, I hope. Before Regina arrived I made this four minute video after two bike rides around Dorfen. I hope you like it! After the video are some some pics from the last month, first in the San Francisco area and then here in Germany. The Perlstadt family, who I've stayed with for almost three months over the last year. I love them! My all-grown-up niece Brooke, who just graduated from high school. She's off to UC Santa Barbara soon. She's lucky I'm not her Dad - I'd lock her in a closet. She's too pretty to be let loose on a college campus. My friend Lauren and our charges for the weekend, Nathaniel and Sebastian. Sebastian is our godson. This is Noah, he of a hundred expressions, my favorite model in Munich. I stayed with him and his parents last year when I was here. 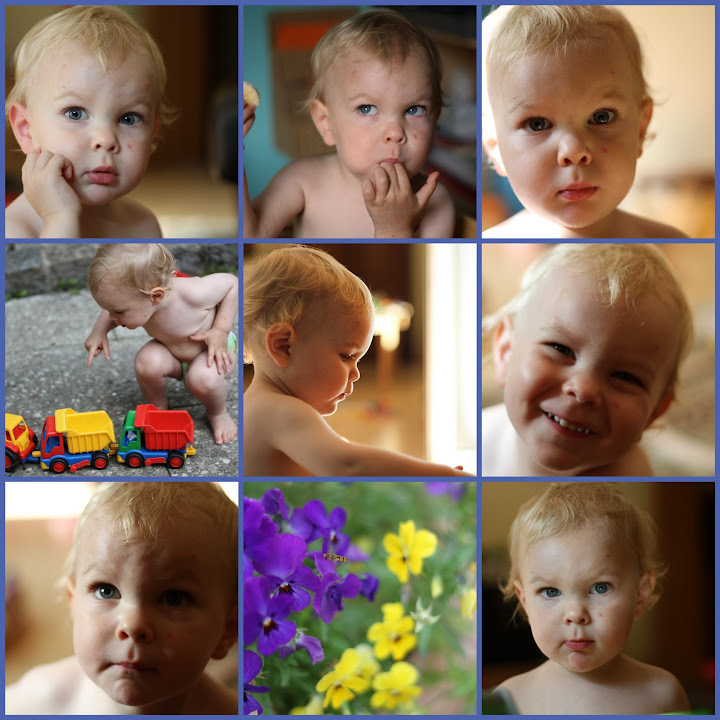 He just turned two, and I took these photos of him as I babysat him (briefly) last week. Tabea, Noah's half-sister, 14 years old. This car drives back and forth along the upper walkway of the Temple. Brigitte tells me she had one of these years ago! They have three wheels, and the the hood opens out to let people in. This is the famous roof of Munich's Olympic Stadium, taken from the top of the Seattle Space Needle. I guess that's not the tower's name, but it could be, if it was in Seattle. I'm not that into facts, really. We are way up there. Those are people in the seats on the right. The don't-jump barrier on the observation deck. The Christopher Street fair in Munich's main square. It's a big gay pride thing, from the looks of it. We couldn't account for all the feather boas until someone told us. We're kind of slow. A performer on stage. Very talented. A piece of paper art in one of the booths. 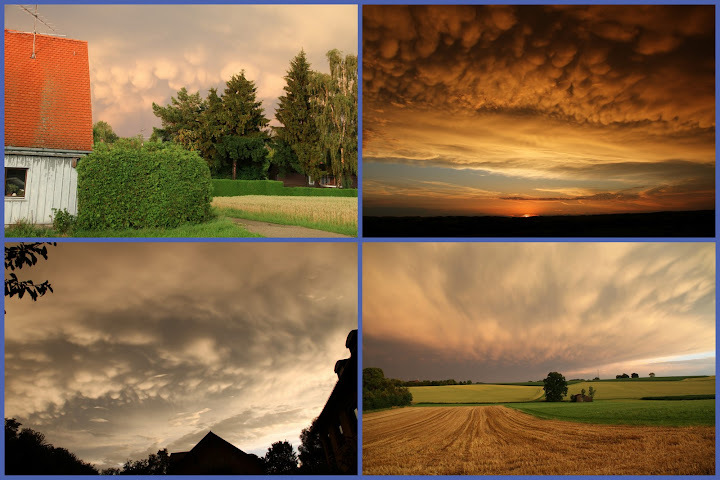 We've had some amazing weather, including one of the biggest thunderstorms I've ever seen, as we drove back at night from Munich. These pics are from last night's sunset. Dramatic! And to remind you, if you don't know, this is the van! Very groovy. 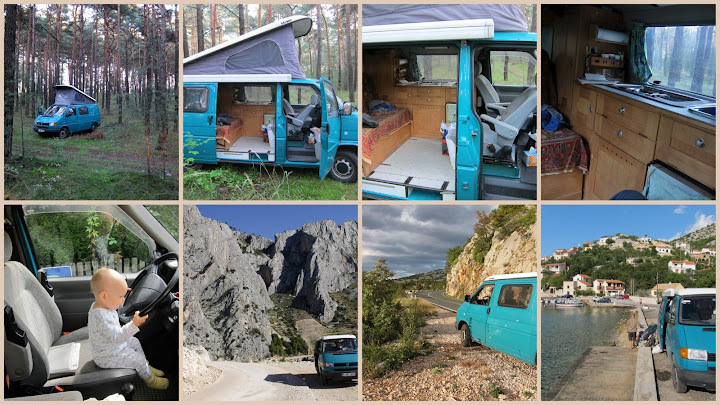 The pics are from last year, in Germany and Croatia. That's Noah in the lower left.